This appears to be one of the ‘new’ rookie set here, as the Crown Royale, Limited Phenoms and others are essentially updates to those previously released sets. These cards feature 2 player worn material pieces and the players autograph. I’m guessing it will include the same group of rookies Panini has used recently in other sets with materials/autographs; and I’ve listed them below for reference. This set will update the Silhouette Set that was originally release in 2011/12 Panini Crown Royale Hockey on February 15, 2012. The below list are early cards confirmed to exist via promotional photos from Panini. 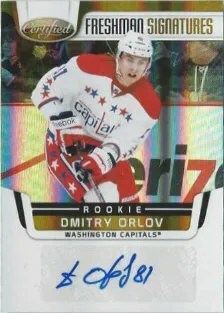 Panini didn’t release Luxury Suite, so here are the RC’s! “Pinnacle Trophy Collection” sets of the past. Nice cards. player if one exists. These are cards from various sets. might actually make completing the set more fun – as I often know I get frustrated and have many partial sets. 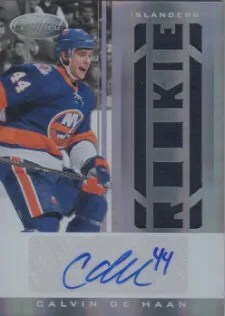 The big hits are the Ryan Nugent-Hopkins autographs, and the silhouette hits are really nice too.